and spiders. The border has geometric and diagonal reeding. With a framed poem. 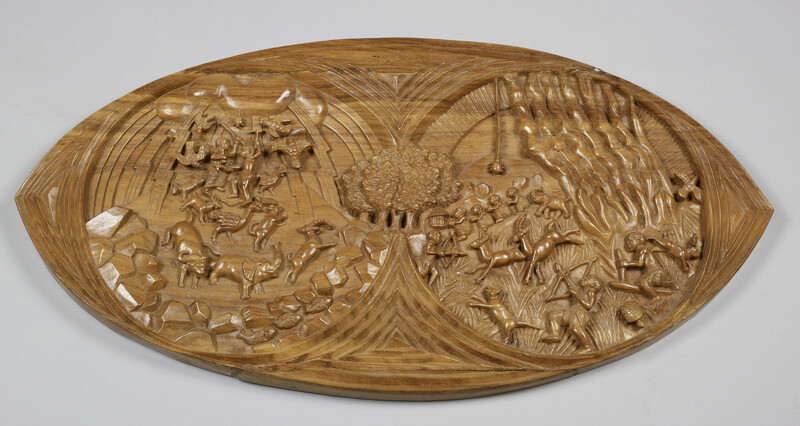 It depicts the creation story for the Chewa people. The Chewa believe that men, women, animals and all living things were created by God (Chiuta, Chauta) at Kapirintiwa, a mountain on the boundary between central Malawi and western Mozambique, during a thunderstorm. As a result of the storm, the rains softened the hard surface, but as it hardened again, their footprints remained engraved in the actual rock. The rain coming down and the animals bursting into life can be seen in the carving. The Chewa are the largest ethnic group in Malawi.